"Quite simply the best album and DVD I have ever made” says Eddie. For a limited edition, signed, gift-wrapped, fan-exclusive preorder copy send £19.99 for long-play CD and £24.99 for DVD , or to preorder the normal long-play cd send £12.99 and £17.99 for DVD via entering “stuff@bigredradiorecords.website” as the payee. Include your name and postal address. Fans get a free download track from the concert soundtrack “The Devil’s Joker (live)” with this pre-order offer. For more information on the album and DVD join the mailist to receive the current newsletter. (10/09/2015). New Album goes straight in at No1in the AirplayDirect Download singles AND album charts AGAIN (VOl 1 did the same in April). OUT NOW Limited Edition hard-copy double album featuring the 2 chart-topping download albums. 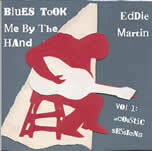 Out November 17th from all major Download providers internationally, Volume 2 of Eddie’s “Look-Back” album. A selection of the best of electric band recordings over the last 25 years. What the fans have been asking for! 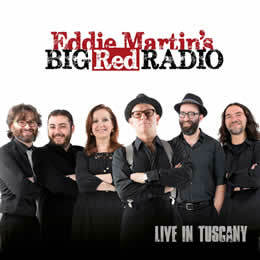 This carefully selected collection of songs celebrates the 25 years and 13 albums of Eddie Martin’s recording career. With varied arrangements – some lush, some sparse – this record showcases the energy and vitality that Martin has brought to the genre of acoustic blues. Songs of love and loss, work and hardship sit side-by-side with dramatic narratives and humorous words-of-advice. Fans of Martin’s guitar and harmonica skills will not be disappointed, there are also one-man-band tracks displaying his instrumental virtuosity and band arrangements which draw upon expert musicians from both sides of the Atlantic (Chicago-born and trained Michael Wiedrich on drums and Paddy Milner (Best British Blues Instrumentalist Winner) on piano). All-in all this collection encompasses the tough and tender sides of this award-winning blues performer over the course of his prolific career. • No 5 in Top 50 Global Blues Cd Releases on Airplay Direct’s Chart of up to 7,800 radio stations at end of year. • No 2 on the “Bad Dog Blues” Radio chart, New York. • No 4 on “Blues Train Fm” Radio’ Chart. • It was also in “Blues in the North West”’s list of Best CD’s of 2012. 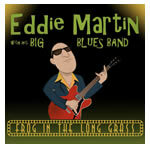 NEW DOWNLOAD SINGLE RELEASE from the "Looking Forward Looking Back" new Eddie Martin Big Blues Album with special guest Pee Wee Ellis "FROG IN THE LONG GRASS" Released April 18th 2012. Download it NOW from Amazon . Also available from itunes, 7Digital etc. See Latest News for more details. 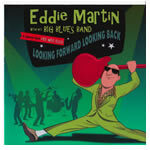 NEW ALBUM RELEASE "Looking Forward Looking Back" Eddie Martin Big Blues Band Album with special guest Pee Wee Ellis. 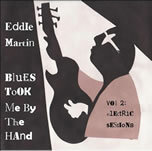 Founded in 1995 as the Record Company for producer, singer-songwriter, guitarist, and harmonica player Eddie Martin, Blueblood Records ("blues-in-the-blood") has also distributed releases for other top blues artists.The catalogue is distributed digitally via Cadiz Music to 7digital, Amazon, CDON, DJDownloadeMusic, Ex Libris, fye, HMV Digital, Hutchison 3G, iLike, iMesh, iTunes, Juno, Magix, Media Markt, Medion, Meteli, Mixmag, MOG, Motor FM, Music Gremlin, Nokia, Napster, Play, Reggae Inc, Rhapsody, Samsung, Saturn, Spotify, Sunrise, Synacor,TDC Musik, Tesco, Weltbild, Zune. For the current list of worldwide in-store distributors email or visit CADIZ MUSIC. Blueblood Records offers Worldwide publishing and licensing opportunities from its music and song catalogue of over 100 wholly-owned tracks. Past credits include BBC National TV and Radio (theme tunes and incidental music), Independent UK Television and Film Production Companies, and song placement and sub-publishing with other international recording artists. For publishing, sub-publishing, licensing and song placement queries contact Blueblood Records .